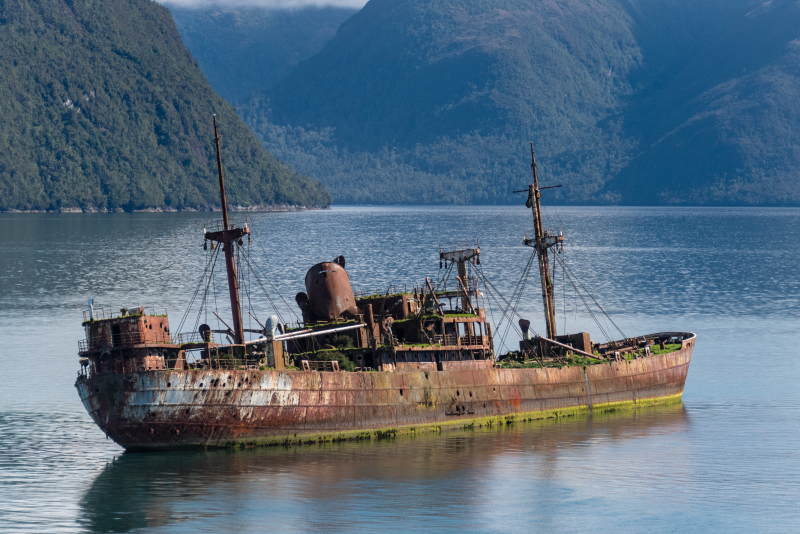 Wreck of a former cargo ship carrying bagged sugar from Santos, Brazil, the CAPTAIN LEONIDAS - IMO 5427057, ran aground on April 7, 1968 in the fjords of the Canal Messier (Messier Channel), north of Angostura Inglesa (English Narrows) and the town of Puerto Eden. Ship is shown on March 14th, 2019. 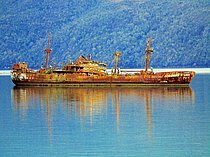 For 51 years, the ship has been sitting firmly on the flattened top of an underwater mountain called Bajo Cotopaxi (Cotopaxi Bank). The water is 200 meters deep just 100 meters from this wreck. Position of wreck is 48°46'19.826" S 74°27'9.606" W.
Our Chilean pilots said that the holes in the hull are from the Armada de Chile (Chilean Navy) performing target practice. Ship traffic in this part of the Messier Channel is light but the wreck and Bajo Cotopaxi are hazards. The Chilean Government has mounted a light and an IR reflector on one of the masts of the ST. CHRISTOPHER to serve as a lighthouse and navigational marker (NGA-nr: 2068, Adm.: G 1552). Thank you for the sharp eye. I have corrected the description. This photo has been shown 909 times since it was added to the site.